All inning long the crowd at Nationals Park was ROARING. Most all of 23,944 had stayed till the very end. And each and every one on them was announcing their presence. South Capitol Street was ROCKING. The True 10th Man was being a difference. Major League Baseball's schedule was ending in The Nation's Capital for 2009 and no one rooting for Our Washington Nationals wanted anything less than a Curly "W" being put in the books. If you don't believe the HEART shown in the bottom of the 9th inning today, both on the field and in the stands, was nothing short of endearing--then you will never be a fan of Our Washington Nationals. Never has Our New Ballpark buzzed so much--so consistently for one entire frame. Never has everyone been on the same page since this new ballyard opened on South Capitol Street. Never had anyone following DC's Team lived this type of moment which occurred at 7:42PM Eastern Time on September 30th, 2009 from someone not name Zimmerman--exactly 38 Years since The Washington Senators played their final game in 1971 at the old ballyard on East Capitol Street. And thanks to Justin Maxwell there is now officially recorded another great finish since Baseball Returned To Washington in 2005. The bases were loaded with Nationals and two were out. 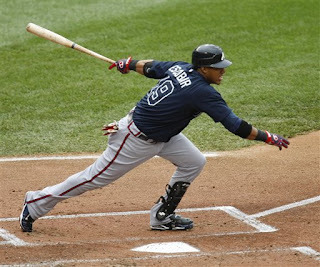 Justin Maxwell was stepping to the plate--a late inning replacement for Josh Willingham. Adam Dunn had just drawn a crucial full count walk off K-Rod, Francisco Rodriguez, The New York Mets Closer to inch Washington JUST a bit closer--but still down by one at 4-3. Those exhilarated supporters buoyed by yet another chance to win. Certainly, no one really knew what to expect next. K-Rod can be dominating at times--overpowering and impressive. But in this incredible bottom of the 9th--he was anything but. You could feel it in the crowd. Tension turned from home side to visiting side. Not many sitting down for most of this frame while the noise level was simply off the charts. Impressive was the encouragement. The best all season in fact--with the very best on the field to come--momentarily. Maxwell stepped in and took ball one, then proceeded to take called strike one and called strike two from Home Plate Umpire Kerwin Danley. Down to his last strike now, hope was still not lost. Those still cheering among the faithful would not let go to the belief that J-Max could do it. Just a single was all anyone wanted. What everyone got was unbelievable--no less than stirring. Playing like a veteran, Justin dug in realizing that Rodriguez would attempt to get him to swing away at something in the dirt. Off the plate crap that less experienced hitters dive for and get themselves out with. Game ending pitches you see all the time, most every day of any baseball season. Fortunately, Maxwell had learned that lesson on this early evening and was not falling for it. And when Our Number 30 took ball two and then fouled off ball three--a battle ensued. The focus now directed toward the pitcher on the mound and a young man batting at the plate. No one watching was going home just yet. This was just too exciting. Not until J-Max took his full set of cuts. Nerves were now on display. The pressure that comes with any game on the line--before a supportive home crowd encouraging their very best. No professional player will ever tell you anything different--THEY LIVE FOR THIS MOMENT. The chance to shine. The opportunity to be a difference maker. The hero where the spotlight first glared down on Francisco Rodriguez. But, panned over to Justin when he took ball three on the 6th pitch of this At-Bat. One of those tosses that had everyone sighing in relief that Umpire Kerwin Danley did not call STRIKE THREE! Maybe to close to take, but far enough away that Danley gave Maxwell extended life. Staying alive for another pitch which J-Max successfully fouled off behind home plate into The Stars & Stripes Club. Followed by another foul ball--this time down the right field line--that JUST made it off the field and into the stands. One of those "GET OUT!! GET OUT!! GET OUT OF PLAY!! screams by everyone rooting for Washington. Blowing with all their collective breaths to push the ball into the crowd. A successful wish when the baseball landed safely in the hands of a fan. THE MOST EXCITING AT-BAT OF THE SEASON was now at its climax. The 9th & final pitch of 2009 was about to take place. Everybody now transfixed, standing and watching the proceedings. The hollering in support of Our Washington Nationals as loud as ITS EVER BEEN!!. "Let Go Nats!! Lets Go Nats!! Lets Go Nats!! This for a home team having lost 103 games this season. While others may have lost faith, The African Queen and I had not, and neither had the thousands standing alongside us giving their all. As K-Rod looked in for the sign and Maxwell set himself--this moment in time--was about to begin. The scoreboard clock struck 7:42PM and Justin Maxwell struck his finest blow as a Major League Baseball Player. Swinging hard on The Mets Closer's 92 MPH Fastball, Our Number 30 connected solidly and slammed the baseball DEEP into left field. The Entire Crowd yelling in excitement. The stroked baseball heading toward the wall--and in what seemed like an ETERNITY--never seemed to come down as New York's Leftfielder, Angel Pagan rushed back to the wall. Would it go over the wall? Would it bounce off of it? Or, would Pagan catch it? No one quite knew until Angel Pagan leaped--AND DIDN'T COME DOWN WITH THE BASEBALL IN HIS GLOVE. Bedlam at Nationals Park!! A Grand Slam For Justin Maxwell!! You would have thought Our Washington Nationals had just won The National League East Title? A two out, two strike, nine pitch At- Bat in the bottom of the 9th inning, in the final home game of 2009, had set off a celebration unlike any in the two short years of Our Ballpark. Literally, fans were jumping all over themselves in joy. And Our Washington Nationals were jumping all over Justin Maxwell at home plate. The party was on and J-Max had provided all the favors. Final Score from Nationals Park where The At-Bat Of The Year sent everyone rooting for DC's Team home as happy as anyone had been all year: Our Washington Nationals 7 and The New York Mets 4. Curly "W" Number 55 was for all Our Fans on Fan Appreciation Day. As General Manager Mike Rizzo stated to The African Queen and I shortly after this game ended: "I have never seen anything like it. Fans were standing and cheering and encouraging our players to the very end." And The Bang!! Zoom!! Of The Fireworks!! signaling once and for all: When Our Washington Nationals become a contender--Nationals Park will have a home field advantage like few others. The 10th Man exhibited their fighting spirit tonight and Justin Maxwell quenched everyone's thirst for victory with a dramatic game ending home run that will not be forgotten for years to come. A positive direction for Our Fans to kick off the upcoming Hot Stove Season. And a high note to hopefully kick off the career of the young and talented Justin Maxwell. No one deserved the opportunity to shine better than J-Max this day. He needed that blast. Just an amazing ending and three game sweep at the hands of The New York Mets--completed on the very last swing, on the very last pitch, of the very last game of 2009 at Nationals Park. Worth repeating yet again: "Don't Ever Leave Early!!" 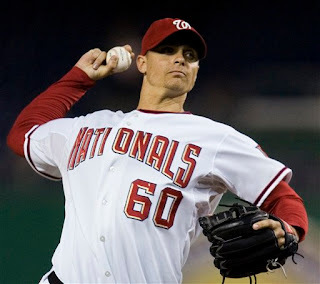 Unfortunately, John Lannan did not get his 10th win of 2009. A no-decision again not of his wrong doing. 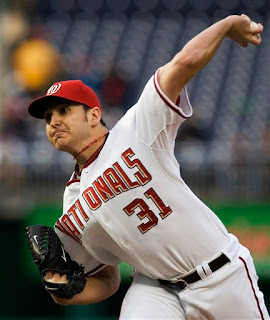 Our Number 31 pitched another solid 7 innings, allowed three runs (two earned thanks to a Ryan Zimmerman error) and finished his season with an ERA of 3.88. Ron Villone became the pitcher of record when Washington rallied for 5 runs in the bottom of the 9th off K-Rod. Villone's 5th win against 6 losses. Lannan's good friend, Tim Redding, went another six strong innings against his former team, allowing just one run and four hits. He was not involved in the decision. K-Rod simply blew up for The Mets and lost his sixth game of the year and was charged with his 7th blown save. Ryan Zimmerman crushed a fastball from Bobby Parnell in the bottom of the 8th to the deepest part of Nationals Park--centerfield. His 33rd Home Run of the season was also 104th RBI. Now tied with Adam Dunn for the team lead in runs batted in. The game deciding bottom of the 9th frame played out in this fashion against Francisco Rodriguez. Leadoff infield single from Alberto Gonzalez hit to shortstop. Single up the middle by Mike Morse (Jorge Padilla then pinch running). Willie Harris sacrifice bunt. Elijah Dukes walk. Ryan Zimmerman strikeout. Adam Dunn full count walk to score Gonzalez. Justin Maxwell Grand Slam. While Abe, Tom and Teddy ran the normal Presidents Race this evening, George took off toward left field and around the third base foul line. 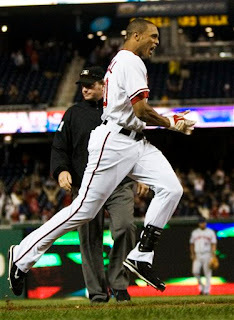 As it turned out, GW made the right move as The Finish Line for the final race of 2009 ended near the leftfield foul line. Abe & Tom upset over the course change. Teddy didn't seem to mind. The final giveaway of 2009 was a Red Curly "W" Fleece Blanket given to the first 20,000 fans in attendance. Being the last home game of the season, Sohna and I took the opportunity to say goodbye for a few months to some of our friends in and around Nationals Park. Folks that make the experience of attending each and every home game an enjoyable experience for us. And finally, My Best Friend!! Screech!! stopped by to see us in Section 218 for one final time. We took the opportunity to watch the game together and take this classic picture. Many surrounding us got a real kick out of it. He Made The Catch!! HE MADE THE CATCH!! The African Queen and I hugging each other over what we had just witnessed. Those words had come bellowing out of my mouth after watching Elijah Dukes leap, grab and slam himself into the Out Of Town Scoreboard at Nationals Park. The game ending out and Defensive Gem now in serious contention for The Defensive Play Of This Year!! Except for Ryan Zimmerman's walk off homer in the bottom of the 9th against The Florida Marlins back on September 9th, no crowd ALL SEASON on South Capitol Street had been so loud. There might have only been 19,614 officially watching, but when The Bang!! Zoom!! Of The Fireworks!! were heard this group sounded like 30,000, maybe a little more. For far too long Our Washington Nationals have come up short--defeated--many times of their own doings. But tonight, in the penultimate home game of 2009, DC's team fought back from another early deficit, battled back to tie this affair up; and pulled ahead on two of the worst defensive miscues by The New York Mets you might see all year (back to back) while holding on to victory by the SLIMMEST of margins at the very end. If you love baseball, all its quirks and odd bounces, this was your night. Game Number 80 on the home season schedule was just a terrific ball game. It didn't matter that Our Washington Nationals are nearly 50 games below .500 in the standings. It didn't matter that The New York Mets aren't much better than that. What mattered was that thousands showed up to watch Major League Baseball--and left understanding DC's Team didn't give up. No, not just yet. The end to the regular season schedule may well be only five days away, but you couldn't tell tonight by the celebrations being held--both on the field and in the stands at the conclusion of this one. People do care and most all those that turned out this evening at Nationals Park were treated for that loyalty. During Fan Appreciation Month on South Capitol Street, what better than a thrilling victory to send the home side fans to their cars and Metro trains happy. Of course, no one watching in the very first inning thought this fantastic ending would have been possible. Not with Washington's Starter J.D. Martin being unable to find home plate. Not when 34 pitches in that initial frame, Martin had Interim Manager Jim Riggleman so worried, Marco Estrada began warming up with ZERO OUTS recorded in the game and one run in!! Yet, Our Number 60 not only survived that initial peril but his second inning pitched as well--when he allowed two more New Yorkers to score. Down 3-0, J. D. Martin certainly could not have been long for this game? But on a night of twists and turns that all favored Our Washington Nationals--Our Rookie Starter had The New York Mets right where he wanted them. How else could you explain The Mets being shut out the rest of the way? In fact, six complete innings from J.D.? I doubt Interim Jim or Pitching Coach Steve McCatty believed what they were seeing with their own eyes. Smoke and Mirrors the rest of the way for Martin. Just two more hits recorded by New York against him, none of which provided a serious threat. The slowing down of the game--by good pitching--which allowed Our Washington Nationals to power their way right back into this affair. How else can you explain Mike Pelfrey cruising along throwing a one hitter into the bottom of the 5th--only to see a leadoff single by Pete Orr and two run homer by Ian Desmond bring DC's team back to one. How else can you explain three more singles--all with two outs in that same exact frame--from Willie Harris, Elijah Dukes and Ryan Zimmerman that evened the score at three. The tying of this game which set up a fascinating 8th inning which led to the spectacular 9th. What else can you say when The New York Mets loaded up the bases with NOBODY OUT in the top of the 8th. And didn't score. A single by Carlos Beltran. Another single by The Mets Daniel Murphy that had every Nats Fans wondering: "Do you think Adam Dunn could have at least bent over and tried to pick that hard hit ground ball up?" And a walk by Tyler Clippard to Jeff Francouer. Certainly, Our Washington Nationals would pay for their latest mistakes. But incredibly, DC's Team got out of one serious jam, when Brian Schneider popped to Ryan Zimmerman in foul ground at 3rd base and Pinch Hitter, Jeremy Reed, lined a rope right at Alberto Gonzalez at second base--who relayed a quick toss to Dunn at 1st for the inning ending double play. Francouer too far off the bag. A little bit of luck, combined with a little bit of skill which permeated this 8th frame. How else can you explain how Washington took the lead? Nothing stranger than when Mike Morse drew a one out walk and what came after. Justin Maxwell pinch ran for Morse. 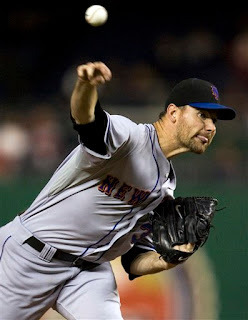 "The Guz" then stepped to the plate--pinching hitting for Clippard. Not hitting the ball well of late and sidelined for the rest of the season in the field with a sore right throwing shoulder, Cristian Guzman, has not been swinging a hot bat for some time. And Our Number 15 didn't do so tonight--but the result of his hack turned this game around. What happened next was truly remarkable. How else can you explain a routine double play ground ball hit to New York's Anderson Hernandez at shortstop (yeah--the same guy that used to play for us earlier this season). A sure inning ending play in which Hernandez underhand tossed the baseball so far away from his 2nd Baseman Luis Castillo--the resultant look on Castillo's face at the error depicted nothing short of incredulous. Which made what happened moments later actually funny. Castillo was pissed at Hernandez. Yet, when Ian Desmond followed by hitting another possible double play ball to shortstop, Hernandez fielded the baseball by diving to his right and threw to Castillo at second. But with "The Guz" barreling down on Luis and wishing to take him out on the relay--The Mets' 2nd Baseman inexplicably attempted to throw to Murphy at 1st Base. A terrible decision with Guzman taking him out. A mental miscue by Castillo that resulted in the baseball scooting past Murphy at 1st base--sending Justin Maxwell home with the go ahead run. And sending Washington Fans into great cheer watching from the stands. After seeing Castillo look at Hernandez with disdain over his error just a few pitches earlier--the look that Hernandez gave to Castillo on his error--could have killed. Both were mad, at each other, and themselves, for giving Our Washington Nationals the lead. Yes, The Mets were talking to themselves again. That narrow advantage that appeared safe with two outs and a full count on The Mets David Wright with Angel Pagan standing on first base for New York in the top of the 9th. Nearly the ENTIRE CROWD now standing. "Let's Go Nats!!" prevailing throughout the park. And as Mike MacDougal set himself, the rhythmic clapping continued. Washington's Fans were expecting victory. What no one believed possible was the absolute suspense to come. You can watch hundreds of baseball games and not see what transpired over the next 15 seconds. Angel Pagan took off on MacDougal's final toss of this game. David Wright slammed Mike's 96 MPH Fastball to right centerfield. The National League Perennial All-Star nailed that pitch. No question about it--Wright had hammered it. Like a rocket, the ball set sail toward the Out Of Town Scoreboard. Sure to be a game tying hit if not caught. Another Game Changer which Elijah Dukes had other ideas. Like a cat, Our Number 34's reflexes and jump on this ball was fantastic. Elijah ran hard toward the warning track and the wall--then realized the baseball WAS STILL OVER HIS HEAD. With no margin for error and Pagan already rounding 3rd base and heading for home--Dukes LEAPED at the last possible moment as the baseball soared over his head. Getting his glove up JUST IN TIME--Elijah snared the baseball less than two feet from the wired fence that protects the electronic board. Slamming into the solid object HARD--Dukes then somersaulted backwards on the warning track. And amazingly, held onto the baseball. Out Number Three Recorded!! The Robust Cheer from those on hand at Nationals Park chilling to experience. Elijah Dukes had performed the near impossible while executing the most thrilling Defensive Play Of This Game and possibly this year. What a catch! What a moment!! He Made The Catch!! He Made The Catch!! "I guess Elijah Dukes now fully understands why The Mets are talking to themselves," declared The African Queen while we were jumping up and down--laughing. Final Score from Nationals Park where there is NO QUESTION about this very fact--no one believed Elijah Dukes would make that fabulous catch: Our Washington Nationals 4 and The New York Mets 3. Curly "W" Number 54 was as satisfying as it gets. A down to the last pitch thriller. A come from behind victory. And solid outing from a rookie starter that many felt was lucky to just get out of his first inning pitched this evening. The Bang!! Zoom!! Of The Fireworks!! signaling the fun has not yet ended on South Capitol Street. The Season may well be lost--with just one more game to be played at home and four on the road to Atlanta. But that doesn't mean individual accomplishments can't go a long way toward settling some thoughts and ideas for Version 6.0 (2010) of Our Washington Nationals. When everyone gets together in Viera, Florida next February, J.D. Martin, Elijah Dukes and Ian Desmond (all key players this Tuesday) proved tonight they deserve the opportunity to try to make the club. Mike Morse too. How else can you explain a power hitting bench player starting for the fourth consecutive day at four different positions on the field? Our Washington Nationals didn't roll over to The New York either of the past two nights. And in doing so set up a possible sweep of The Mets in the final home game of 2009. An N.L. East Foe that has dominated DC's team since baseball returned to Washington. Give J.D. 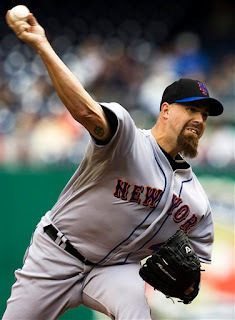 Martin credit, he really didn't look good during his first two innings. Three runs on five hits and two walks---then just as poorly as he had thrown--Martin shut down The Mets for four more frames. Leaving after the 6th in a tie ball game, Our Number 60 did OK after all was said and done. But he wasn't great. 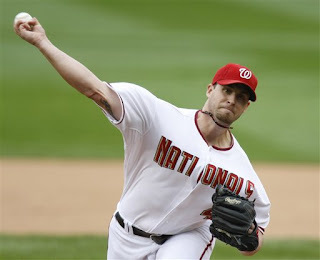 Average on this day but Washington improved to 9-5 with Martin as their starter. J.D. 's personal record, 5-2 over his last 10 starts. Tyler Clippard earned his third win of 2009 by surviving that no outs, bases loaded situation in the 8th and being the pitcher of record when Anderson Hernandez and Luis Castillo decided to throw this game away for The Mets in the bottom of the 8th. Mike MacDougal--pitching for the 4th straight day--getting his 18th save of 2009--thanks to Elijah Dukes. Just enough offense tonight to win for Washington. Desmond with a key two run homer to left off Pelfrey, a double and a stolen base. I don't know if its being more comfortable at the position or just not being moved around as much--but Ian Desmond looks a whole lot better playing shortstop and shortstop alone. He's made some really nice defensive plays over the past two days. And he's shown some terrific range and a GREAT ARM. He and Ryan Zimmerman on the left side of the infield is pretty exciting. They both cover so much ground. Too bad our right side of the infield is lacking in that respect. The Z-Man with his 103rd RBI of 2009 with his single scoring Willie Harris in the bottom of the 5th. It's also worth mentioning a defensive play by Mike Morse in the top of the 6th. Playing left field, after starting at 1st base, 3rd base and right field over the previous three days, Our Number 28 got a nice jump on a Jeff Francouer drive over his head in the top of the 6th. Turning just once, Morse showed some decent defensive glove work and some speed when reached OVER HIS HEAD to catch the line drive off Francouer's bat. Not known for his defensive capabilities--Mike Morse made a really find catch and it should be noted. Francouer couldn't believe that ball was caught either. Finally--rushing from work to the game this evening--I actually forgot to take our digital camera--leaving it behind in my gym bag. Sorry. Sohna couldn't believe it. Neither could I. My Bad. So none of the usual extracurricular photos tonight. But we can tell you--The Final Tee-Shirt Tuesday (A white NatsTown Tee with "DC" logo on the front) was handed out to the first 10,000 fans to enter Nationals Park. And Abe won the Presidents Race for the 40th Time this season. The New York Mets were down to their last out. The crowd at Nationals Park was standing and cheering. For just over 2 hours & 30 Minutes Our Washington Nationals had played a clean, crisp baseball game. A solid six inning start from a rookie pitcher. Just enough runs to take a slim lead. Quality relief work not seen in these parts for most of the past month. And not one single error. DC's Team was on the verge of winning in conventional style. Appreciated by many still remaining on South Capitol Street among the 18,600 officially announced. Washington Fans had witnessed a very good ball game. One in which Birthday Boy--Ryan Zimmerman--knocked in Washington's first run on a sacrifice fly in the bottom of the 1st. A plated run by Justin Maxwell which included a tremendous head first deek around The Mets Omir Santos at the plate and a slap down of J-Max's left palm across home plate to score. A solo shot, and third consecutive home run in as many days, off the bat of Mike Morse in the bottom of the sixth. The key blow that put Ross Detwiler in position to garner his first Major League Victory. A personal win deserved thanks to six professional innings of pitching. Our Number 48 in white was pretty outstanding this evening. Ross isn't going to strike out many hitters. He not going to overpower them either. But what this rookie lefty showed tonight was an aggressiveness to hit his spots around the plate. Let the opposing batter hit him. And then let your defense take care of their business. Inconsistency has been his problem on the Major League level all year, maybe even some maturity. A big advancement shown on the mound this evening by Ross Detwiler. A readiness not seen from him all year. Success breeds confidence and it's never the other way around no matter what anybody tells you. Our Number 48 is gaining wisdom. The ability to throw and control a Big League Game. Just look at his four appearances since being recalled from AAA Syracuse. Detwiler has pitched 18.2 innings, allowed just five runs and only given up more than one run once--against The Dodgers (three) five days ago. Ross' ERA for September a solid 2.41. Although, he does need to cut down on those seven walks allowed. When only John Lannan, Livan Hernandez and Tyler Clippard have really been effective hurlers so far this last month of the season--Ross Detwiler has sort of snuck up on everyone and has gained ground--probably some momentum too--as the 2009 Season comes to a close and a fresh new 2010 looms on the horizon. This Missouri State Product was highly touted as Washington's Number 1 Pick Overall in the 2007 Draft. Many observers felt Detwiler had regressed since becoming a professional. When you spend two straight years at Single A Ball without advancing, people are going to doubt your talent. Yet from the very moment Our Number 48 was sent down EARLY in spring training--the worries began that Ross might not be able to turn the tables on a stumbling start to his professional career. Since then, he has been a completely different pitcher. No one can doubt that. Is he polished enough to be trusted most every single time out there on the mound? No, because Detwiler still has much more to learn. But what this 23-year old lefty showed tonight was advancement. Even when Detwiler threw two wild pitches and gave up three singles in the top of the sixth--he didn't panic. He didn't give in to The Mets. What he earned was his eventual first Major League Victory when he struck out Nelson Figueroa with New Yorkers on 2nd & 3rd and the game on the line. 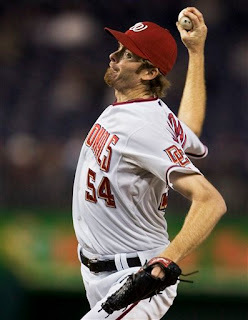 Battling every step of the way, Ross Detwiler has put himself back into contention as a projectable starter come 2010. Something many probably within Our Washington Nationals own organization didn't think possible just six short months ago. The tall lanky southpaw wearing Jersey Number 48 has proven many a critic wrong and in doing so has positioned himself for next season and beyond in the rotation for Our Washington Nationals. Thanks to his own personal efforts. And thanks to the work of his teammates out of the bullpen tonight that sent everyone rooting for Washington home happy from South Capitol Street. Jason Bergmann with two shutout innings of work. Mike MacDougal working a 1-2-3 9th-including that final out at 9:37PM which found Our Number 54 inducing a ground ball to Ian Desmond at shortstop--who fired to Mike Morse at first base to end this game. A 6-4 routine play on a routine night of baseball that had everyone cheering for Washington--content to watch a Conventional Win. Not a lot of drama, just some solid baseball. Final Score from Nationals Park where as Mike Rizzo stated to Nats320 a few months ago: Mike Morse "can flat out hit" and did so again tonight with three hits this evening: Our Washington Nationals 2 and The New York Mets 1. Curly "W" Number 53 providing a fresh outlook on DC's Team. A young slugger wearing Number 28 getting the chance to hit and maybe finding a role for 2010 (his bat is exciting to watch). A young lefty getting the chance to pitch and maybe finding his role as well in the starting rotation. And the Bang!! Zoom!! Of The Fireworks!! providing the backdrop for a DC Team in transition that sent out on the field as starters this evening--six players that were staples of The AAA Syracuse Chiefs lineup in 2009. Mostly youth--which most would call inexperienced--that provided tonight on South Capitol Street as Conventional of a Major League Win as you will ever see. Detwiler, he was good. But so were Jason Bergmann and Mike MacDougal. This was a close game, never more than one run the difference at any time. Any scenario could have played out in victory or defeat--which means pitching was key. Ross, Jason & Mike did not let a loss happen tonight. Ryan Zimmerman provided the early lead. Mike Morse the final lead. And Our Pitching held up giving Detwiler his first Major League Win and MacDougal his 17th Save of 2009. Of course, Detwiler got the typical Shaving Cream Pie In The Face for his first win. This time provided by John Lannan while doing a postgame interview on MASN. 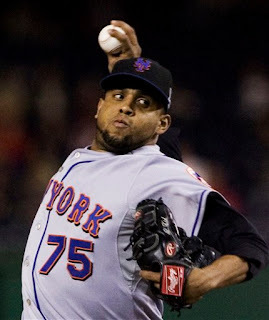 The Mets journeyman starter--Nelson Figueroa--didn't pitch that bad himself. What he did do was get beaten by Mike Morse who flat out slugged another home run the opposite way in the bottom of the 6th. An 88 MPH fastball over the outside corner of the plate that Our Number 28 just took the other way and easily cleared the right field wall. There is NO QUESTION ABOUT IT--Morse can hit. He needs to find a position as a National League player. If he does, Mike Morse could be dangerous. Size, power, the bat speed--he has all the makings of THE GUY you want on your bench. Quite frankly it's hard to believe Mike Morse has sat on the bench so much since his recall from AAA in August. Give the guy a chance, he's been pretty good. Much like what Ryan Zimmerman is most every single day out on the field. Celebrating his 25th Birthday, Our Franchise Player knocked in his 102 run of 2009 with his sacrifice fly in the bottom of the 1st. Zimmy has scored 105 runs, hit 32 home runs, 33 doubles and has played the finest 3rd Base in The National League this season. No one comes close. The Z-Man is deserving of a Gold Glove and we are fortunate Baseball Management locked him up as our very own until 2013 and hopefully--forever. Ryan Zimmerman is such a joy to watch. Again tonight--The Defensive Play Of This Game--which came after Anderson Hernandez singled to lead off the top of the 5th for The Mets and Josh Bard misplayed a routine sacrifice bunt by Figueroa by throwing to second base--wrongly. Our Number 11 then rushed in with nobody out on a Angel Pagan bunt and--as he does as well as anybody ever in the game--picked up the baseball barehanded--and while still running toward the first base line--heaved a perfect underarm toss to Alberto Gonzalez covering 1st base. You can't take that effort for granted. Zimmerman ended up nearly in Washington's On Deck Circle--he had ran so hard. Providing a key out that allowed Ross Detwiler to settle down in a precarious situation and retire both Luis Castillo and David Wright on a line out and ground out, respectively, to Ian Desmond at shortstop. Mike Morse had two singles and his home run in going 3 for 4 tonight. His batting average up to .306. Our Number 28 has just 36 At-Bats and has knocked in 10 runs. 10 Runs!! Five of his 11 hits are for extra bases. Yeah, he's struck out 12 times, but his bat is potent. The potential to be that big bopper off the bench that managers covet. COVET. The African Queen and I got to Nationals Park early today. We decided to watch Batting Practice for both teams from the leftfield bleachers. We picked up two BP home run balls. One from Ian Desmond and the other hit off the bat of Justin Maxwell. It is always interesting to see the conversations and friendliness amongst players for different teams. Being a Major League Player is a fraternity and the sight of Livo greeting his former Mets Teammates, David Wright chatting with Ryan Zimmerman and John Lannan shagging flies while chatting with his good friend, and former Nat, Tim Redding enjoyable to see. Especially, when both Lannan and Redding will face each other this Wednesday for the last scheduled home game of 2009 at Nationals Park. The 2009 Team Photo was the giveaway today. Considering 20,000 were available and only 18.600 showed up, there must be a few extras. Usher Lead Captain Bill and Supervisor Jimmy hanging with Sohna as we came in the park this afternoon. The Tours Guides of Nationals Park presented The Washington Nationals Dream Foundation with a $75,000 check in pre-game ceremonies. Money raised from the tours given at Our South Capitol Street Ballpark with all proceeds given to Our Washington Nationals charitable arm for distribution to their many causes. Abe again won the fourth inning Presidents Race, his 39th win of 2009. And finally--take a look at the finest Curly "W" haircut of all time. ALL TIME!! This on a youngster sitting just below us in Diamond Club. NatsHD even showed this wonderful head on the HDTV scoreboard during the game--to a tremendous cheer. When the rains began to seriously come down at Nationals Park this afternoon, Our Washington Nationals were already down 5-0 to The Atlanta Braves. Another early deficit and up hill battle which DC's Team never was able to overcome. Looking to stay dry as the downpours continued, The African Queen and I moved a few rows back in Section 218 of The Stars & Stripes Club. After the switch, there were a couple of young boys now sitting with their parents two rows in front of us. Folks we had not really noticed beforehand. Clearly, the kids and the two parents were friends. They were just out enjoying an afternoon of baseball. The score really didn't seem to matter. Major League Baseball was being played and the youngsters were having a great time. One of whom actually got a foul ball. A day of fathers just being with their sons. Reminding me of my youth, when over the course of six years (1966 to 1971) my brother, Michael, and I attended as many Washington Senators Ball Games we could possibly get to at first D.C. Stadium and later renamed RFK Stadium. Back then, we had gone for the baseball. And we went to have a good time. And we went to LEARN something about playing Big League Baseball. Winning and losing didn't really mean a whole lot to us back then. Look, these were The Expansion Washington Senators. If Hondo slugged out a home run--we went home happy. True. Ask Phil Wood that--he will tell you the same thing. There was talent on the diamond back then in The Nation's Capital. Just not enough of it to win consistently. Much like the situation currently involving Our Washington Nationals these days. Direction which was never found before The Senators moved to Arlington, Texas. Footing which Our Washington Nationals are currently planting. Even when today's game got well out of hand, these kids were still into the game. And their parents were explaining and reviewing most every play. Explaining what was just witnessed and teaching what should have been done if an error or mistake was made. And there were plenty of those opportunities this afternoon for lessons. This was not a pretty game. All this instruction fitting--because one of the youngsters was wearing a tee-shirt with the following two sentences printed on its back: "Talent is what you have. Effort is what you give." The Fathers' Motto throughout this entire affair. A point they emphasized all day long: "You may believe you are the best player out there on the field of play. But none of it will matter if you don't give your best every single minute you are on that field." Throughout the game, the parents were quizing their kids over what they just saw? What could have been done better? How would you have handled that situation? Lessons in baseball, of the mental type, that can go along way toward educating children just learning the nuances of The Great Game. But the parents weren't getting into the way of their children's enjoyment. They were enhancing the experience. Class was in session this Saturday Afternoon and, quite frankly, fascinating to watch. In fact, much better than the actual game playing out in front of us on South Capitol Street. And the care and meaningful dialogue brought back fond memories of those many times sitting in the stands on East Capitol Street when I was the age of these kids--taking in the game, having fun while grasping and becoming better versed in How To Play The Game. Yeah, The Washington Senators of my youth didn't win a whole lot back in those days. And neither are Our Washington Nationals right now. But what a pleasure it was to witness two fathers and two sons enjoying a Major League Baseball Game in The Nation's Capital this Saturday Afternoon. The score didn't matter, the outcome neither because these parents were teaching their youngsters one of the most important facts in life: "Talent is what you have. Effort is what you give." The exact same lesson taught by my parents nearly four decades ago. Final Score from Nationals Park were DC's Team was never really into this game, but at the same time--strangely enough--were never quite out of it until the 9th inning came along: The Atlanta Braves 11 and Our Washington Nationals 5. Loss Number 102 in 154 Games was similar to all that has come before during this final home stand of 2009. Down big early and continuing to make fielding mistake after fielding mistake--Washington dug a hole so big there was really no way they were going to dig themselves out this time. Like so many games of my youth when The Senators were down, my brother and I rooted for Frank Howard to step to the plate and swing his lumber. And just like back then, those two kids enjoying the game today, innocently in front of us, experienced a similar moment in the bottom of the 8th when Our Franchise Player, the talented Ryan Zimmerman (getting the day off to rest) pinch hit with a chance to tie this game up at 6 apiece if he so happened to knock the baseball out of the park. A comeback that did not happen when Our Number 11 flied out to right field. But provided just enough excitement to let those children go home even more happier because they had seen their hero give his best effort. Garrett Mock really didn't pitch well. He also wasn't helped by his defense. Pete Orr thought twice about throwing a dribbler hit to him charging in from 3rd base in the top of the 1st inning. And when he hesitated, Orr lost the grip of the baseball and threw it into the ground. An infield single and throwing error which allowed Brian McCann and Yunel Escobar to score Atlanta's 3rd and 4th runs of the very first inning. This after Escobar had driven a two out, two strike single to right scoring Martin Prado and Chipper Jones. Mock continuing to not find the necessary out pitch when in trouble. Seven hits, four walks and six runs allowed (four earned) is not getting job done over five frames of pitching. The talent he possesses. The finishing he does not. And even after Zack Segovia came on in the top of the 6th to pitch three innings of scoreless ball. An effort that actually allowed Washington to creep back into this game thanks to a pinch hit three run homer off the bat of Mike Morse and RBI single from Willie Harris--Our Bullpen again let everything get out of hand. Mike MacDougal unable to find the strike zone. And when he did in the 9th, The Braves hit him. Much the same with Ron Villone who allowed a crucial home run for the second time over the past three days late. This time, McCann taking Villone deep and into the upper deck of the rightfield seats near the Scoreboard Walk and Foul Pole. McCann hammered that pitch for a two run shot that, basically, closed this game out. But not before Logan Kensing allowed two more Braves to cross home plate (one charged to him). 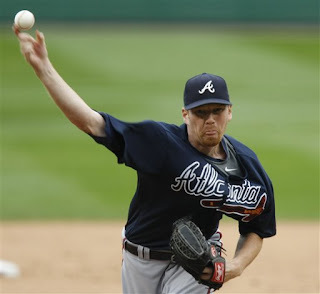 On the other hand, Atlanta's young phenom pitcher, Tommy Hanson, was cruising along until Morse flat out SLUGGED a 93 MPH Fastball to dead centerfield. An absolute blast that landed on the green grass below the Batters Eye. A three run pitch hit homer that gave Washington's Fans something to cheer about and hope they could come back all the way. A long shot which didn't happen when Hanson settled down to finish seven complete while striking out seven. That young man really has some good stuff on the mound. And doesn't seem too phased about being a rookie. Elijah Dukes had two really bad errors today. In the top of the 2nd, Chipper Jones hit a liner right at him, right at his glove. And Our Number 34 simply muffed it. Later, in the top of the 9th when this game got really out of hand when The Braves scored five runs, Dukes bent over to pick up a single by Adam LaRoche. He didn't bend over enough and the baseball scooted right under his glove and past him. 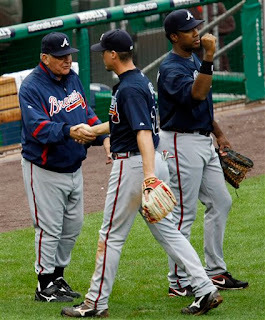 Sohna and I really like how The Atlanta Braves line up after a win to congratulate each other. Instead of the those in the dugout rushing out onto the field--they line up and meet the players one by one. Sort of classy and different. Teddy returned for today's Presidents Race and came from behind to take the lead as all four Presidents turned the corner at the right field foul pole. As those among the announced crowd of 29,058 rose to see if Teddy would actually win?! Teddy decided to take in the love and proceeded to dance a jig in front of the stands. Abe rushing past to take the honors at the red tape. The Washington Nationals Dream Foundation raised nearly $3,000 for their charities this afternoon with their final Saturday Auction of the season. Among the items bidded on: Cristian Guzman, Elijah Dukes & Willie Harris signed jerseys. A base from Opening Day 2009, Jesus Flores signed cap. And signed bats from Adam Dunn and Willie Harris--as well as a 2009 Team Signed Baseball. The rain came down steadily all game and forced the grounds crew to continually work the infield and mound to keep the field playable. Unfortunately, the bad weather cancelled the Gospel Music Fest scheduled as the post game entertainment. And finally--there was a Movie Film Crew with a panaflex camera set up in the camera well just to the left of Our Washington Nationals Dugout today. Sohna and I are guessing they were filming game action for that movie shot earlier this summer at Nationals Park and throughout Washington, DC starring Owen Wilson and Jack Nicholson and Reese Witherspoon. The one where The African Queen, myself and a few hundred other fans of Our Washington Nationals participated as extras. Should Willie Stay? Or, Should Willie Go?